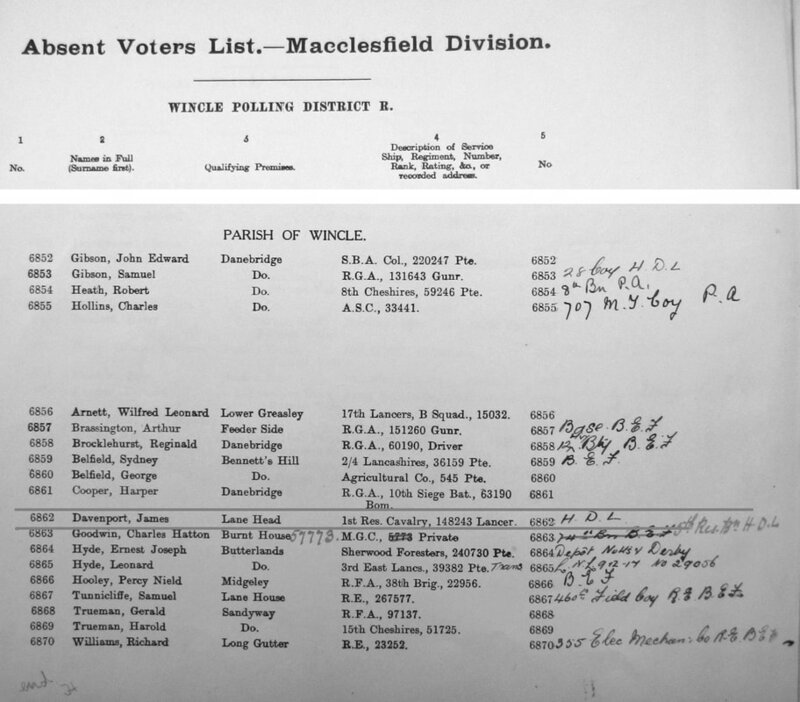 James was born in Wincle on 22 November 1898. He lived with his parents Nathan and Elizabeth (known as Eliza, nee Mitchell) at Lane Head Farm, Wincle and his sisters Dorothy, Anne and Marjorie. Eliza died in 1913, shortly after James's brother John was born - John was later to die in WWII (RAF). We have been unable to find any military records for James although the Absent Voters List states he was in the 1st Reserve Cavalry, in one of the Lancer Regiments. The absence of medal records could suggest he never actually made it to a theatre of war. However his family remembers him telling them he enjoyed eating curries with fellow soldiers during the war which would indicate he was stationed in India, but again we have been unable to unearth anything to confirm that. James continued to live at Lane Head after the war, taking over the farm by 1925, the year he married Lilly Maydew Warren of Hilly Lees, Swythamley at Swythamley Church. They had no children of their own but adopted Joyce Hine after her parents died of TB in the 1930s. James was instrumental in helping to run the Wincle Church Fete for many years and was its opener in 1958. They moved to Ivy Dene Rushton in 1948 and to Edgecroft in Heaton in the 1980s. He died in 1989.